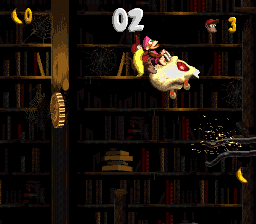 Haunted Hall is the twenty-fourth level of Donkey Kong Country 2: Diddy's Kong Quest and the second level of Gloomy Gulch. 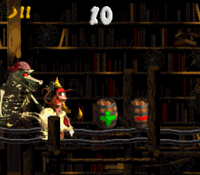 Haunted Hall is a rollercoaster stage and the only level in an old, abandoned library setting. 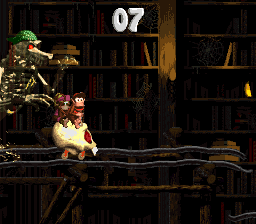 As such, Diddy and Dixie ride a Skull Cart throughout most of the level. Kackles are the main enemy in Haunted Hall, where they make their first and only appearance. There are four Kackles in the stage, and each of wear a uniquely colored bandana. They are encountered in order from blue, green, yellow and lastly purple. In the Game Boy Advance version, every one wears a blue bandana. Each Kackle has their own portion contained between two gates. As soon as the Kongs go through an entry gate, a countdown timer appears on the screen, and a Kackle begins to chase them. The Kongs must prevent it from running out, because if it does, the Kackle briefly materializes and injures one of the Kongs. The Kongs can counteract the countdown timer by running into Plus Barrels, which increase the timer. At the same time, however, Diddy and Dixie must avoid hitting the antonymous Minus Barrels. In the later parts of Haunted Hall, some of the Plus Barrels are harder to reach, and in some cases, both a Plus and Minus Barrel are grouped together. Nothing happens if both are simultaneously hit, as this negates the effect of both. Haunted Hall is one of two levels (the other being Castle Crush) without an identically-named level in Donkey Kong Land 2. Haunted Hall was replaced with the generic amusement rollercoaster stage, Krazy Koaster. Since the world map of Gloomy Gulch remained unaltered, Haunted Hall is erroneously shown from it to take place in the same abandoned building as Haunted Hall. A Kackle chases the Kongs. The level begins on a large, wooden platform with a gap ahead of it. Two hooks are above the gap to aid the heroes in crossing. Inside of this gap, the Kongs can find a Dixie Barrel that is able to fire them to a Golden Feather, and then back onto the starting platform. A track is also on the other side of the pit with a Roller Coaster on it. As soon as the cart is entered, it begins to move and take the Kongs along a bumpy path to a small ramp with the first DK Barrel near it. There is a gate near here. When it is entered, a Kackle with a blue bandanna starts to chase the primates. As it chases them, the heroes ride up a hill towards a Plus Barrel, followed by another on the bumpy track. A gap is right after this with the letter K above it. As the two friends travel farther ahead, they ride up a hill with another Plus Barrel on it. The track soon flattens out. As the Roller Coaster moves along it, it approaches two Minus Barrels with only a small space between them. A gate is after the pair, and when it is passed through, the Kackle ceases to chase them. A bumpy path is after here. A hill is at the end of it that pulls the heroes downwards. As they ride down the hill, they can notice a separate track hidden nearby that leads to two Bonus Levels. If the miss this track, they ride across a track with two Zingers above it. Shortly after passing the two foes, they ride through the second gate, causing the second Kackle to chase them. Upon entering the gate, they ride up and down a large hill. A Plus Barrel is on the way down it, while another is at the bottom of the hill. Three more Plus Barrels are along the bumpy trail ahead, but each of them only replenish a few seconds. After the third barrel, the Kongs ride up a hill and approach a gap that they must pass. They ride down a hill after this, traveling towards another Plus Barrel. There is a small gap ahead, but a lower track is in it. A Banana Coin sits on it. Once this small section is passed, the primates come up to a Plus Barrel, followed by another just before a gap with the letter O in it. A Plus Barrel is also at the edge of the other side of the gap. A gate is just ahead of here, and the Kackle stops chasing them when it is passed. The level's Star Barrel floats at the top of a hill found after here. After the Kongs ride down this hill and then wind up another, they come across a gate. Once it is passed and the heroes ride down to the bottom of a hill, a Kackle pursues them again. It chases them into an area full of Minus Barrels, which only decrease the thirty seconds that they begin the area with. They ride towards a pair of Minus Barrels at the start of this chase. A small gap is between the objects. Three more Minus Barrels are along a rather flat part of the track found just after a larger gap. An even larger abyss is after these barrels, but a piece of a track is in it with a Banana Coin on it, so the heroes can cross. A Minus Barrel hangs off the edge of the track right after these gaps. Soon, the primates ride down a small hill leading towards a Minus Barrel with the letter N next to it. An abyss follows here with one more Minus Barrel found in the air at the other side of it. Once they pass this, they travel towards another gate. The Kackle stops chasing them when it is passed. A bumpy track is ahead of here. There are two more tracks found separate from each other nearby. The bottom route leads to a Bonus Level, while the top one leads over a tunnel towards some Zingers. Once they pass this area, they wind over a small hill and pass through another gate. As a result, a Kackle chases them into an area with a mixture of Plus and Minus Barrels in it. A Plus and a Minus Barrel can be found just ahead of here, and they are placed right next to each other. The Kongs flee from the last, purple-bandanna Kackle. Two small gaps are after the barrels, and a track is between the two gaps with a Plus Barrel on it. Another Plus Barrel and a Minus Barrel float in the air after the gap. As the heroes ride up and down the two hills that follow, they come towards a Minus Barrel. Another one of these unhelpful barrels appears after a gap at the top of the hills. The letter G stands next to it. The Kongs ride past four more Plus and Minus Barrels on a bumpy trail just before reaching the next gap. A Plus and Minus Barrel found close together are just after it, located just before another gap. A hill leading downwards to another gap is on the other side of this abyss. It is followed by another gap with a straight, bumpy track after it. Plus and Minus Barrels are placed along this piece of the track. Two more gaps are ahead, and a Minus Barrel waits after each one. Once the heroes pass this final Minus Barrel, they pass through a gate, stopping the dangerous Kackle. They then head over a flat pathway leading into a tunnel to the last area. The Kongs enter the room on a raised platform, and can jump on the End of Level Target located below and next to the raised platform. Its prizes include a Banana Bunch, Banana Bunch Coin, or a red Extra Life Balloon. After escaping from the first Kackle, the Kongs must jump to a nearby rail. There are two tunnels, each leading to a different Bonus Area. The Kongs must ignore entering the lower tunnel, as driving into the upper one leads into the first Bonus Area. The Bonus Area's objective is to collect its Kremkoin within fifteen seconds. The challenge begins with the Kongs riding on a straight track. They soon drive up a steep hill with a Plus Barrel at the top. Upon touching it, the Skull Cart drives backward. The Kongs must carefully direct to jump from the raised rail segments until reaching the Kremkoin. 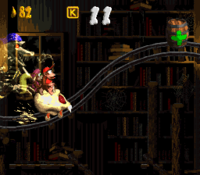 The Kongs lose at the challenge from missing a jump, and the Skull Cart drives backward into the entrance without the Kongs obtaining the Kremkoin. Regardless of winning or losing at the first Bonus Area, the Skull Cart drives backward out its entrance. It then suddenly dashes forward and enters the lower tunnel, leading into the second Bonus Level. Alternatively, the Kongs can drive into the lower tunnel first to directly start the second Bonus Area, although this does not allow them to access the first one directly afterward. 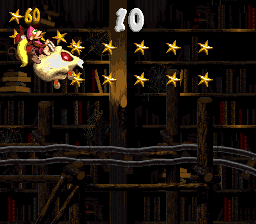 The objective is for the Kongs to collect 120 stars within 17 seconds as the Skull Cart moves forward. There are actually 152 stars in the area, 32 of which are optional for collecting. After Diddy and Dixie get 120 stars, a Kremkoin spawns just outside the stage's exit. The Kongs exit out from the other side of the lower tunnel. Just after they escape from the third Kackle, the Kongs reach a fork. They must jump the Skull Cart on the lower rail for it to drive in the tunnel leading into the third and final Bonus Area. The Kongs have ten seconds to obtain the end Kremkoin. The area is divided into rail sections, so the Kongs are prone to falling down a gap. They must quickly jump the Skull Cart between each rail segment until reaching the end Kremkoin. Above the first gap in the stage. Between two Plus Barrels after a Banana Coin, just before the Star Barrel. Just after the Star Barrel, the Kongs enter the following gate where they encounter the third Kackle. After passing a Banana Bunch Coin, the Kongs can find the "N" right next to a Minus Barrel. Like the letter "N", the Kongs can also find the letter "G" to the left of a Minus Barrel. It is found after driving across first long rail of the final Kackle pursuit. DK Coin SNES: In the final room containg the End of Level Target, the Kongs must walk into a tunnel on the left to obtain the DK Coin. An Auto-Fire Barrel blasts them upward shortly afterward. GBA: In the remake, the Kongs must walk past the End of Level Target and jump to it in the doorway exit. 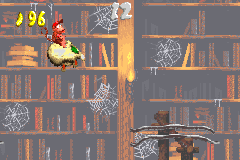 Golden Feather (GBA version) At the start of the level, the Kongs must fall into a pit right before the Skull Cart. A Dixie Barrel is located below, alluded by a lone Banana, and it blasts Dixie to the Golden Feather, then an Auto-Fire Barrel blasts her back on the main stage. It is also possible for Diddy to collect it from doing precise Cartwheel Attack to it, then landing in the Auto-Fire Barrel. Photograph (GBA version) The Photograph replaces the original location of the DK Coin. By collecting it, the Kongs obtain a photo of Kackle on the Scrapbook's fifth page. The Kongs ride down a small hill. The location of the Golden Feather. A Kackle chases after the Kongs. The Kongs drive into the entrance to the second Bonus Level. The Kongs ride under a Zinger. Diddy and Dixie passing through one of the gates. The heroes collecting some bananas. This page was last edited on April 6, 2019, at 02:00.